Copper metal is one of the oldest metal components used in the world, predating back to Egyptian and Roman empires and even Biblical times. It is a ductile metal with a very high thermal and electrical conductive capacity. Unlike majority of its counterparts in the conductivity space it is also highly malleable. It can be forged into just about any form, from metallic rods to strings and rings. That being said, the copper reserves in the world seem to be quickly receding. This is true despite the fact that only about 12 percent of the metal has been mined to date. Because of this reason the price of copper has continued to rise, buoyed by growing demand and increasing production costs. It has become a booming business, its growth is dangerously unsustainable and our reserves and the environment are bearing the brunt of it all. Majority of the copper supplied in the world goes into electrical installations, for electrical equipment and accessories. These items have to be in the purest form. This is a requirement if we want materials to be able to withstand large voltages and high conductivity standards. This kind of quality can only be produced from virgin copper unless you refine used copper through electrolysis. To prevent expensive financial failures that result from hot shorting this quality has to be maintainedat very high standards. This standard can only be achieved from pure virgin copper. Recycled copper has numerous non-electrical uses too. Majority of it used in the production of volumes of plumbing material, heat exchange units and even roofing materials such as roofing sheets and gutters. Such materials do not require high quality copper standards such as conductivity. 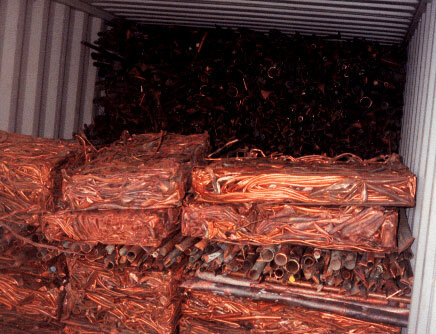 Regular scrap copper can be used to produce such materials within provided quality standards. There are so many reasons that make recycling of copper very desirable. The following are some of the major reasons why copper recycling is finding favor in the metal industry. Financial costs of production – Recycled copper, unlike its counterpart in the pure form costs between 80 to 90 percent of its original form. It is also cheaper to refine used copper than it is to produce it. This helps to meet market demands and thus lower the cost of copper products. Since majority of copper in the earth’s reserve is limited, it would only make sense to make an attempt to preserve the existing resources. Recycling copper is a great way to do so, even though only about 11 to 14 percent of it has been extracted and put in production. Environmentally, copper recycling utilizes a smaller percentage of energy than the production of pure copper. Worse still is the fact that majority of industries in the metal world use fossil fuels to produce energy to run their production processes. Recycling copper means that we will be saving a significant amount of energy required for the production of pure virgin copper and at the same time cutting down on emission of pollutants into the environment.